What Is the Right Embroidery Machine for Appliqué? Appliques have traditionally been stitched by hand in ancient Egypt and India. However, when this craft came to America, technological advancements made machine applique a popular hobby with an easier creation process. An applique involves stitching a contrasting design to a background fabric. This creates fancy, embroidered designs that are customizable to suit individual styles. As such, appliques require more than just a basic sewing machine. They require an embroidery machine to achieve these elaborate designs. To help you pick out the right machine for this work, we list the features you should look out for below. User friendliness is important, particularly for beginners who are embroidering appliques for the first time. Go for those that come with guided tutorials to help you pick up the skill quickly. Another key consideration is whether the machine is only for embroidery or has a sewing function included. If you already own a sewing machine, then you might want to opt for an embroidery-only machine. Yet, if you are new to sewing and embroidery, it could be worthwhile to choose the combined option. Digitized machines are also a top choice among users who want to create unique appliques effortlessly. These machines often come with built-in designs and have an option for downloading additional patterns, offering more choices. Additionally, you may want to consider a machine with a built-in USB port to allow effortless transfers from your computer. Certain machines are even Wi-Fi capable. This eliminates the need for close proximity to your computer. Time to set up your embroidery heaven in a cozy nook of your own choice. Now that we are aware of what features to look out for, let’s look at the top three machines. These machines cater to individuals at every level. So, if you are a beginner or want something more sophisticated, you will find the perfect match. The Brother Designio Series DZ820E is an upgrade from the Brother PE770 with its improved, onboard-computer technology. Hence, it is easier to use, which is perfect for those new to embroidery and appliques. This embroidery-only machine comes with three hoop sizes and a 5-inch by 7-inch embroidery area. 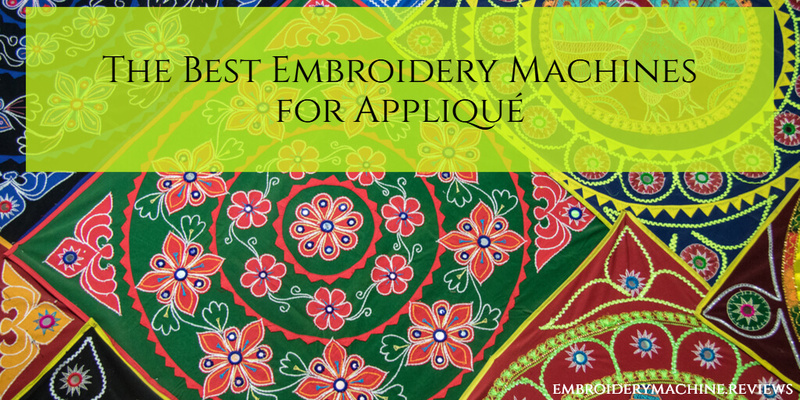 It has 136 built-in designs and six lettering fonts to get you started on making your own appliques. The convenient, back-lit LCD display allows viewing of guided tutorials that cover the machine’s core functions. Beginners can then pick up the art of embroidery easily and gain momentum as they breeze through each project. However, the screen’s low resolution and monochrome settings affect design editing. The machine’s sewing area is brightly lit to provide maximum visibility when working in dim environments or on dark-colored swatches. To make life even easier for you, the machine automatically threads the needle and neatly trims off the ends. Easy to use with a detailed instruction manual included. Three hoop sizes to fit most craft projects. Built-in memory function & USB port effortlessly store and download designs. A single-needle machine requires thread changing for different color stops. Low resolution, monochrome LCD screen is fairly small. View built-in tutorials and design editing features right on the easy-to-use back-lit LCD touch screen LCD display. 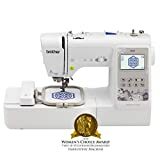 This hybrid machine has more than 400 utility and decorative stitches. It also includes 40 built-in embroidery designs, which are awesome for creating elaborate-looking appliques. Additionally, the embroidery workspace of 4.3 inches by 6.6 inches can accommodate larger-craft projects. 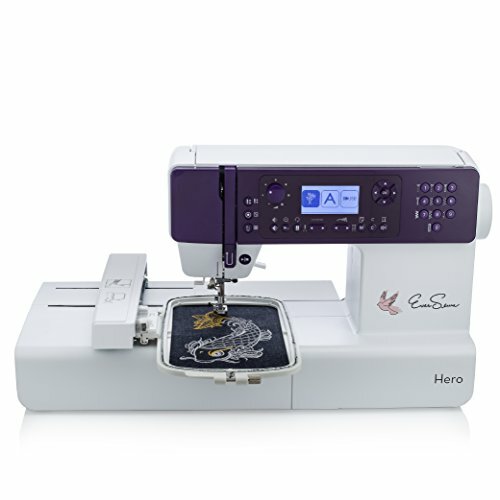 Furthermore, the Hero has automatic needle threading and monitors upper needle and bobbin thread level. 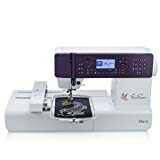 This allows for smooth operation of the machine, so that you can sew and embroider to your heart’s content. Coupled with a USB port, you can easily add new designs to craft personalized appliques. One drawback would be that the machine allows for only one file type. As such, all designs need to be in a .zhs file format for importing. 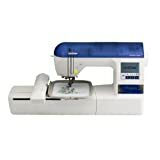 Allows for both sewing and embroidery functions, making it value for money. An extensive collection of embroidery patterns with room for more via USB importing. Designs must be converted to .zhs file format. LCD display has no touch-screen function. The brand’s newest offering is actually an upgrade from its cult classic, the Brother SE400. This new entry has improved capabilities, such as a large, colored LCD display with touch-screen function. What’s even cooler is that you can easily change the thread color with the built-in color palette. After the changes, you can preview the final edit on the LCD screen. It also enhanced its built-in collection to 103 stitch patterns and six embroidery letter fonts that come in three sizes. You can even arrange the letters in an arc, via the touch-screen display. Choose to access thousands of embroidery designs on iBroidery.com or import your own designs through the USB port. This allows you to easily transfer designs from your computer to the machine, even when they are located far apart. Another time-saving feature for user convenience includes automatic needle threading with a simple maneuver of the lever. It also has a jam-resistant, drop-in bobbin that makes ‘fishing’ for the thread a thing of the past. Effortless on-screen editing in full color with touch-screen function. USB memory stick allows easy transfer without a cable. Automatic needle threading and drop-in bobbin. Limited to a 4 by 4 inch embroidery area. Creating appliques to revamp an old outfit or add a touch of personalization is now effortless with an embroidery machine. 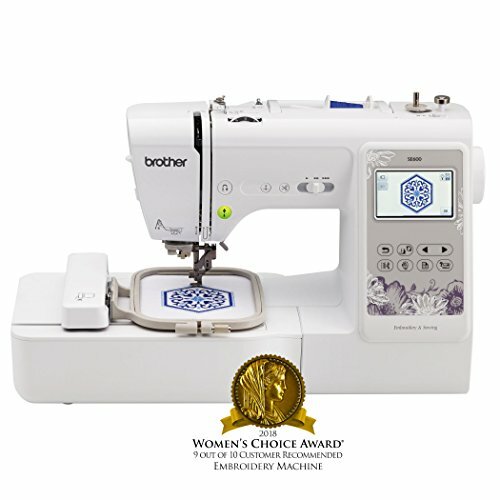 The Brother SE600 is our best choice as it is capable of creating quality appliques effortlessly. Furthermore, the SE600 is a hybrid machine for sewing and embroidery. This makes it a worthwhile investment for expanding the scope of your future projects. This means you can not only add monograms and appliques to garments, but different fabrics can also be sewn together to add sophistication and depth to your appliques. Jump start your applique-making journey with this high performance, easy-to-use machine.